Demand Media—Demand Studios, as some may remember it—was once my favorite place to earn money as a freelance writer. Long, long ago, Demand Media was a successful American content company, founded in 2006 by investor Shawn Colo and former MySpace chairman, Richard Rosenblatt. In 2008, I first applied to work as a writer for Demand Media. I was accepted and immediately encouraged to become familiar with the platform and study all of their writing guidelines. Once I had read through, studied, and printed off the guidelines for reference, I started familiarizing myself with the writing platform. Demand Media provided the titles, templates, and editors, but all research and writing was completed by writers. I became fairly comfortable with the process and started claiming articles from the queue. Failing to abide by Demand Media's guidelines would surely result in rewrite requests—they were fairly strict about them. You only had one shot at rewriting the post before it was completely rejected and the title sent back into the queue. If the rejections continued, you would be placed on "probation." Writer probation decreased your allotted daily claims and your work was constantly monitored for quality. If you still couldn't get your work up to standard, you'd be cut. I loved Demand Media. Pay for articles averaged around $15 to $20 for a 400-word post. This may not seem like a lot, but because the posts were generally easy to write, you could easily earn $30+ per hour. Prior to Google's algorithm changes, I was earning a fair supplemental income with Demand Media. I would work for an hour or two per day, five days a week. My weekly income averaged between $110 and $250. Other writers were earning $800 or more per week. At one point, I was making $250 a week regularly working only five to ten hours per week. After the Panda changes took place, Demand Media began to crack down and titles became scarce. Opportunities were bleak at Demand Media after 2011. We are excited to announce a new program called First Look. It is intended to reward our highest-rated writers by giving them the first look at new titles. Starting this week, the highest-rated writers will have advanced access to view and claim new assignments for 48 hours before they are released into the Find Assignments pool. We've all invested a lot and we want to further reward writers who best exemplify the attributes of good writing. The eligible group will be those writers who maintain an average structure of 4.0 or higher for their last 50 articles. The score will be recalculated with every new article. While we plan to add this updated score to your Work Desk, it will not be immediately visible. We may also at some point modify this method of calculation. If your average falls below 4.0, you will lose First Look privileges until you bring your score back within the qualifying range. In an attempt to be mindful and fair to all eligible writers, all writers' assignment claim limits will be set to 10. As with the current system, once you submit an article, you may claim another assignment. We will notify those writers eligible for First Look via email. All changes will go into effect in the next few days. We will continue to listen to your feedback and invest in programs like this. Please visit this forum thread if you have any questions. After the First Look Announcement was made, Demand Media implemented numerous changes. Writers with a grammar score of 4.0 or higher (based on their last 50 articles) had a 48-hour advantage to view and claim articles. For writers with grammar scores sitting at 3.9 or less, finding articles became virtually impossible. Content pools that were once a writer's paradise, filled with over 40,000 titles to choose from, became an empty, desolate space. Opportunities were scarce and writers began scrambling to find other writing gigs to make ends meet. Sadly, 2011 was when my gig with Demand Media was up. In August 2015, Demand Media closed it's Austin, Texas office.The company rebranded under the name StudioD. Today I’m thrilled to unveil the studioD Talent Network, the new face of Demand Media Studios. Under this new brand, we will continue to be one of the leading destinations for quality content creation for brands. As the talent network, our mission is to match you with leading brands to create content that fuels conversations with their customers and fans. Brands need your skills and as part of our network you will have the opportunity to create some of the most engaging content online. How does this affect you? DMS contributors are automatically part of studioD’s network, no need to reapply or sign up for anything. As we make new projects available, we’ll work directly with individual talent to present them with opportunities. Every project we do will be different; some will require photographers, writers, editors or talent with social followings. Our team will strive to make sure that every match we make benefits not only our client, but you as a contributor, as well. 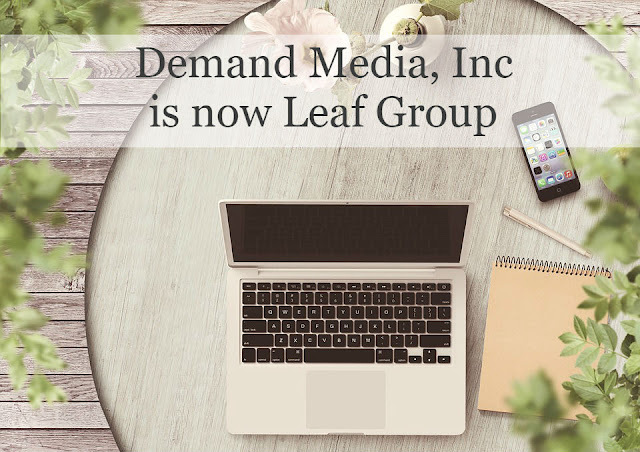 Demand Media Inc is now "Leaf Group." They are still a content company that owns several media and marketplace platforms including eHow, LIVESTRONG.com, Saatchi Art, and Society6. They also provide social media tools and content. I no longer work with Demand Media, now Leaf Group, so I cannot say with confidence that working with them would be worth your time. Honestly, I'm not even sure how they hire talent nowadays, or if they've simply moved forward with some of their top content developers from back in the day. Either way, Demand Media was once a bustling website that helped a lot of people earn a supplemental income and for that, I am grateful.